reconditioned movie themed pinball table! A pinball so powerful that - just like a tornado - it can't be ignored! In each of us there lies a deep-seated fascination with the destructive forces of nature. Most of us know it's not wise to fool with powers of this magnitude. A few of us haven't learned our lesson...yet! Sega Pinball released the Twister Pinball - a game that gave players a new respect for the awesome power of nature! All the excitement of the blockbuster film has been packed into Twister - a game that appeals to players of all skill levels. Top Lane Magnet: Lightning fast turbo-pop action! Back Lit Electronic Targets: You hit them with the pinball soft or hard, they're gonna score! A Spinning Ball Catching Magnet: At the start of 3, 4 or 5 ball multi-ball it grabs your pinballs and throws them out with the fury of a real tornado! Standard and Automatic Ball Shooter: Start each ball with a skill shot to the spinning magnet! 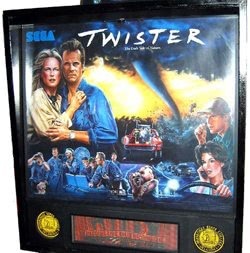 Twister was originally released to the pub, arcade and amusement trade industry in 1996 and was a huge hit.